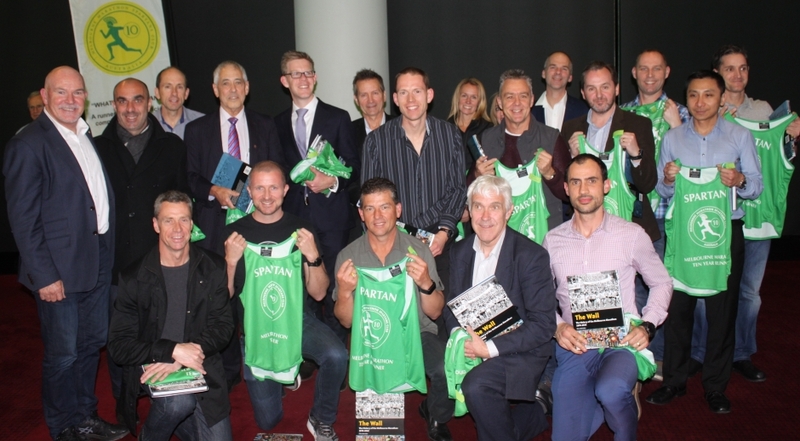 The 2017 Annual General Meeting was held on the Monday the 28th of September with a record number of members present. 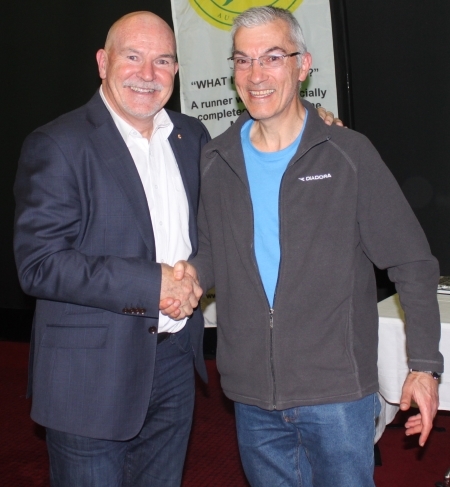 Rob de Castella was an inspirational speaker, devoting some time to his own illustrious career, but also giving a lot of time to the Indigenous Marathon Foundation. 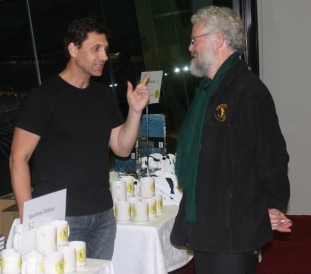 Way back in 2013 Tristan was a very fine guest speaker and presenter! 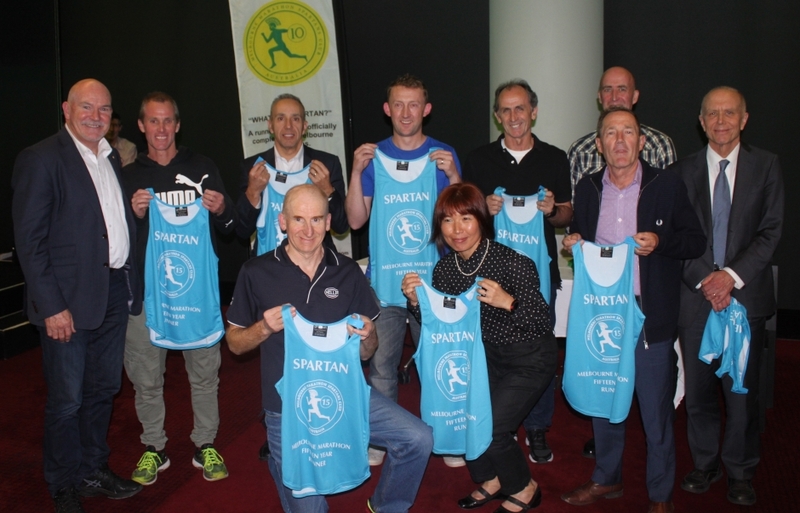 The picture below shows the 10 year Spartans with Rob de Castella at left. 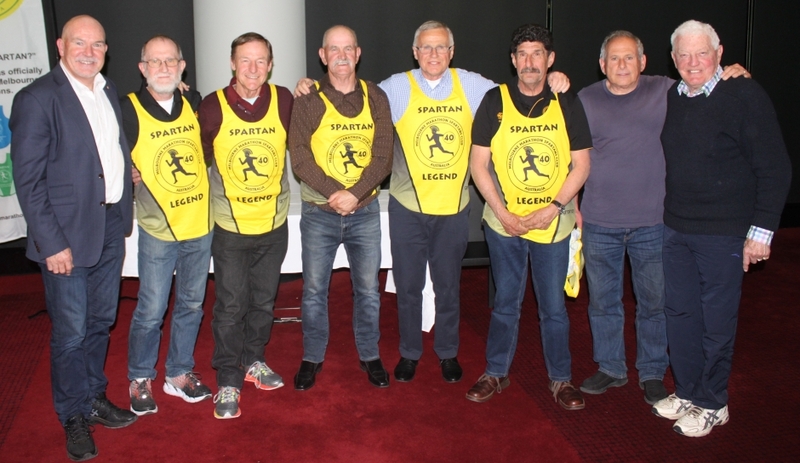 Robert de Castella, Bruce Hargreaves, Wayne Thompson, John Dobson, David Foskey, Frank Biviano, Roger Weinstein, Brian Dixon. 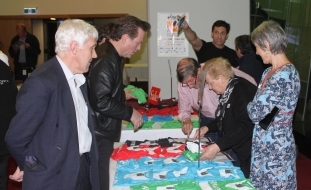 Manny Karageorgiou was unable to attend. 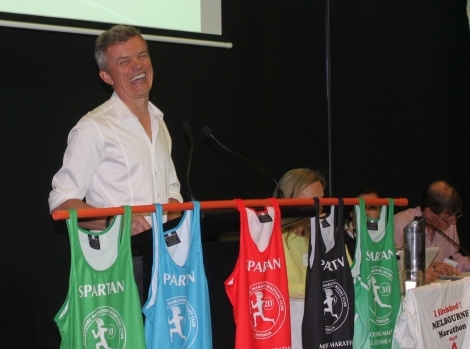 Brian Dixon, as Minister for Youth, Sport and Recreation, was greatly responsible for the birth of the Melbourne Marathon in 1978. He is Spartan S100. 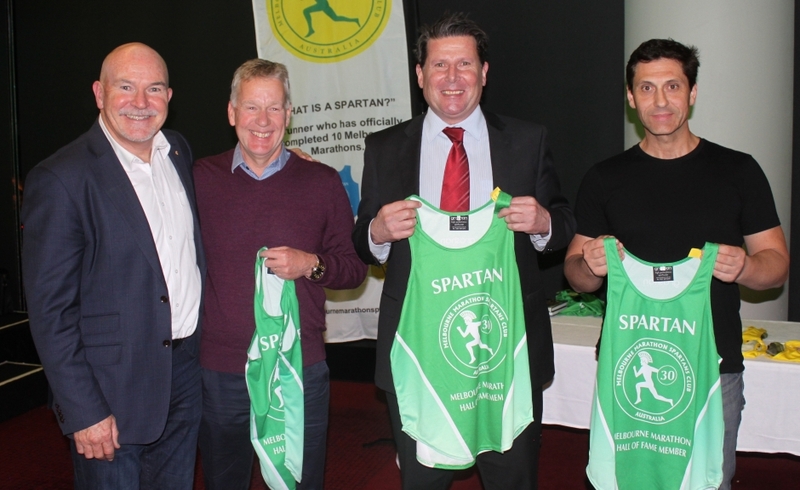 The Spartan Award, introduced in 2005, acknowledges an individual’s commitment, dedication, contributions and determination to continue with their marathon running despite personal difficulties that may be experienced along the way. 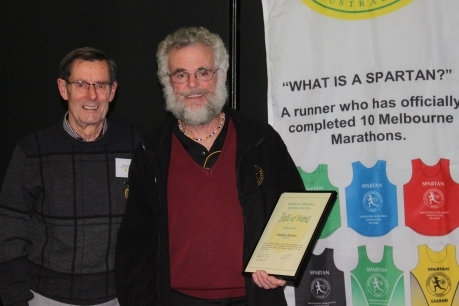 The award recognises and acknowledges the personal difficulties that we are at times faced with and the effort and courage it often takes to continue with the love of running. Manny Karageorgiou is the recipient of this award in 2017. 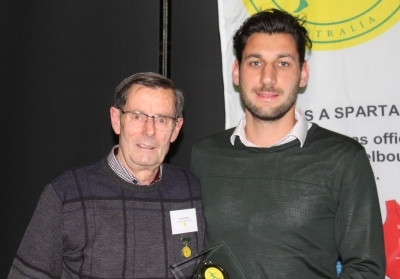 He was unable to accept in person so the award was accepted by his son Pana. 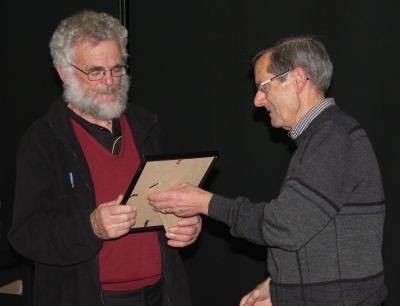 Immediate Past President John Dean making the presentation to Stephen Barker. John Dean and Stephen Barker. 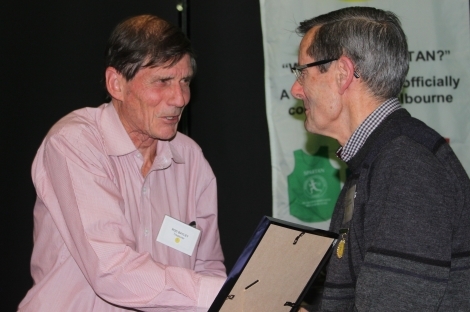 Treasurer Rod Bayley (aka Bryan Ferry) was presented with Life Membership by Immediate Past President John Dean. 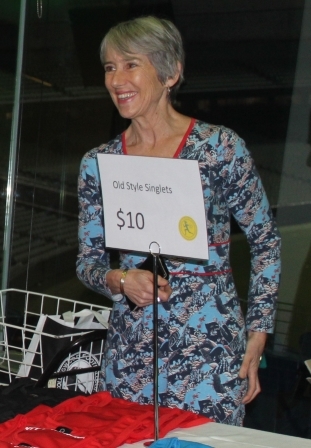 The membership was bestowed because of Rod’s service as Treasurer, singlet organiser (in partnership with his wife Helen, aka The Singlet Queen), and hard working committee member. Ron Young presented Michelle Tham with the “Shirley Young Award” for the fastest female Spartan in 2016. The award is named for Ron’s late wife Shirley who was the only female amongst the Legends. 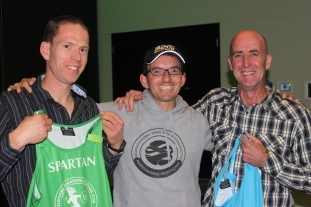 Pete Battrick presented Rob Follett with the “Jack Gubbins Award” for the fastest male Spartan. 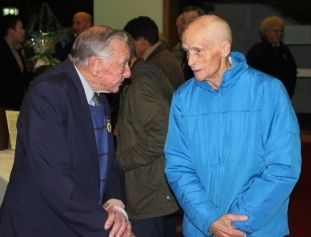 The award is named for Legend Jack Gubbins who passed away earlier in the year. Michelle Tham, Rob de Castella, and Rob Follett. 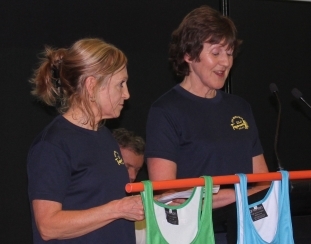 Maureen Wilson and Christine Hodges spoke of their participation in the 2016 Teganuma half Marathon. 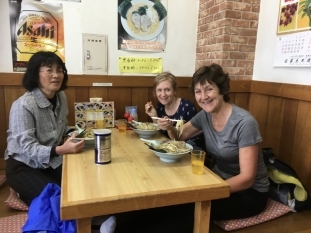 Their photographs showed the race, the food they sampled and an introduction to Japanese culture. 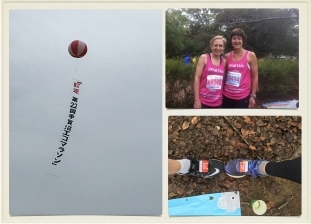 Maureen and Christine before the race. Maureen and Christine at the lectern. 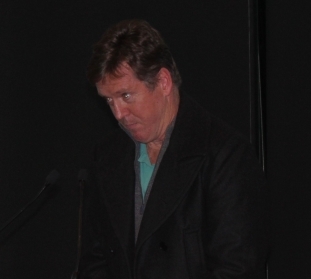 President Jay Fleming gave a summary of the year’s activities and ensured that the night ran smoothly. 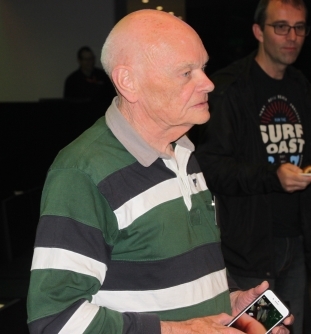 Introducing our magnificent guest speaker, Rob de Castella. A light hearted moment. Perhaps reflecting on Collingwood’s premiership prospects in the next ten years. 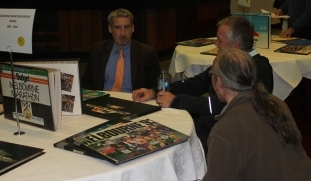 Dean Callow, Ian Gainey and Francis Kasmarek having a chat beside some of the memorabilia on display. John Kaparelis behind the counter. Rod and Helen Bayley joining Cath and John. Cath Bombardieri – priceless, don’t believe the sign! Cath left the committee this year after six years of sterling service. 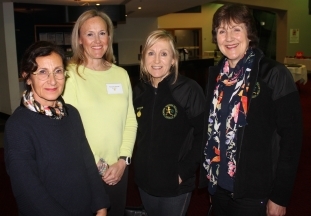 Anne Ziogos, and Felicity Doolan (current co-secretaries), Maureen Wilson (past Secretary) and Christine Hodges (past Treasurer). Maureen and Christine are both Life Members. Ashley Page has retired after a second period on the committee. Over the last few years he managed the task of the creation of the Club’s Governing Rules and oversaw their lodgement. 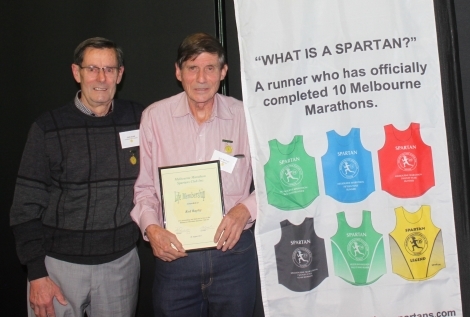 Brian Dixon, as Minister for Youth, Sport and Recreation, was greatly responsible for the birth of the Melbourne Marathon in 1978. 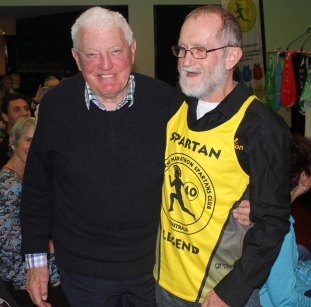 He is Spartan S100, having completed 11 Melbournes between 1979 and 1991. Brian Dixon and Bruce “Digger” Hargreaves. 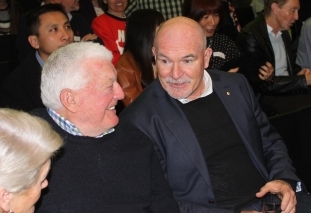 Brian Dixon chatting with Rob de Castella before the AGM. 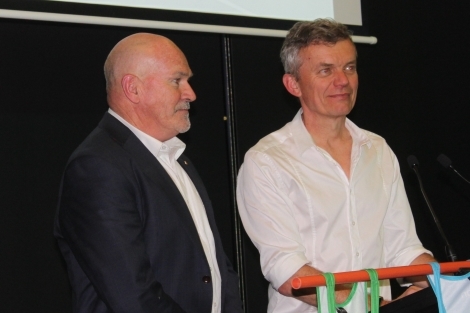 Andrew Mott, Frankie Palermo and Michael Dale. Chris Muirden explaining course changes caused by underground railway works. Chris is also the author of “The Wall”. Ron Young and Antony Martin.